The other day I called on a friend who had just had his chimney swept. I commented that I did my own. The reply, and it was genuine, was, ‘You’re a very clever man. I did my own once and I never saw such a mess. I hadn’t realised that sweeping a chimney called for any particular cleverness – not that I’d be knocking the skill of those who do it for a living. As a rural dweller, I tend to burn some wood to supplement the central heating. 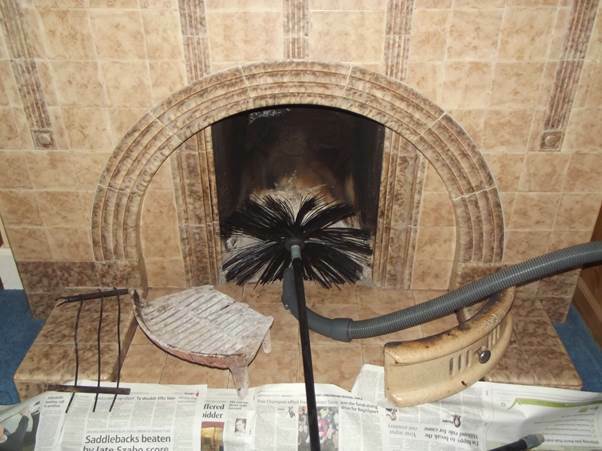 We only have an open fire – that makes sweeping easy. The fire surround is one of those early 1950s tile jobs. It’s very period and not at all to the taste of the twenty first century youngster. Yesterday I did the job, ready for the log burning season. So here we are ready to go. The very simple pieces of the fire are out of the way. Protective newspaper is down. The vacuum cleaner hose is in place and the brush is ready on the first length of rod. I bought the rods many years ago at a jumble sale or charity auction. Apart from the chimney cleaning, they come in very useful when I need to rod through the drains leading to our septic tank. I live in a bungalow, so it is not a huge job. The important thing is to always twist the rods in an anti-clockwise direction which makes sure the rods stay screwed together. 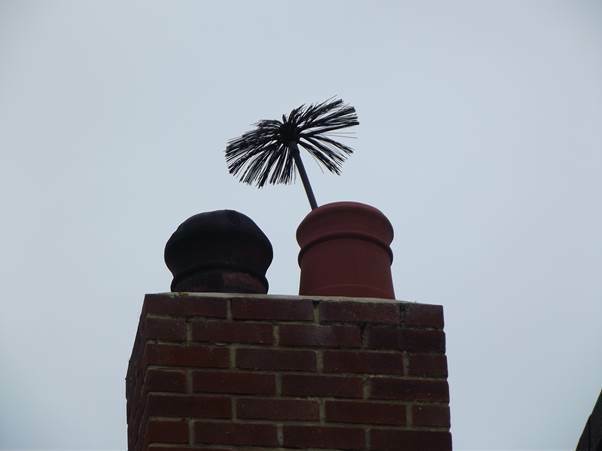 After a few minutes of pushing and twisting adding more rods to get higher up the chimney, the brush appears out of the chimney pot. It is then a case of pulling the brush back down, removing the rod lengths one by one. There’s a goodly pile of soot which I collect with dustpan and brush and spread around some growing vegetables. It is thought that slugs don’t like traversing soot. The vacuum cleaner can collect the little bits that are left. Tidy up – job done! I haven’t yet noticed a layer of black soot settling everywhere! By the way, the second chimney pot is now defunct. I have a grandson, aged 3 at the moment, who is absolutely besotted with Thomas the Tank Engine and friends. 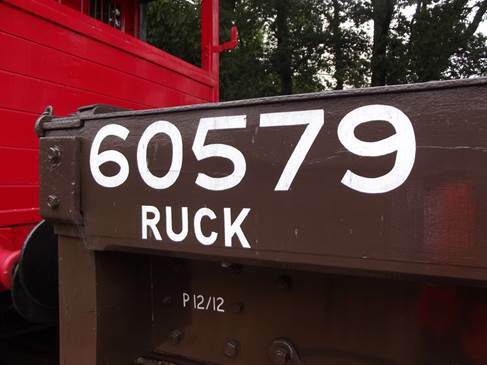 Recently, on our visit to the Isle of Wight Steam railway we came across a truck which carried the name Ruck – a significant name for Grandson. I wrote him a story, somewhat in the style of the Reverend Awdry who first wrote about his railway engines at about the time I was born. I wrote the words. Photographs were taken by me, my wife and the very kind guard who appears in one of the photos. The story is 100% fictitious. No engine was ever pushed by trucks. No engine ever ended up in a bush. No trucks were ever told off or punished. I have promoted a Station Master at Wootton to the role of Controller – clearly a good and kindly one. I hope you enjoy the story which ought to be one picture and text per page. This is the tale of Ruck. Ruck was a perfectly ordinary, if rather old, car truck. I’m sorry to say he was not always as well behaved as he should have been and the Controller had to tell him off and teach him a lesson. Ruck felt lucky. He had worked on the Island lines since he was only a lad and he liked the friendly, happy atmosphere. It was a holiday island and when Ruck was able to see the happy smiling children then he felt happy too. Most of Ruck’s friends had been cut up when some of the railways were closed down by the bad Controller. But somehow Ruck had survived. He was useful and had the sad task of carrying scrap rails and trains away. Eventually there was no more work and Ruck was just forgotten. He sat, quietly, on a siding, dreaming of happier times. 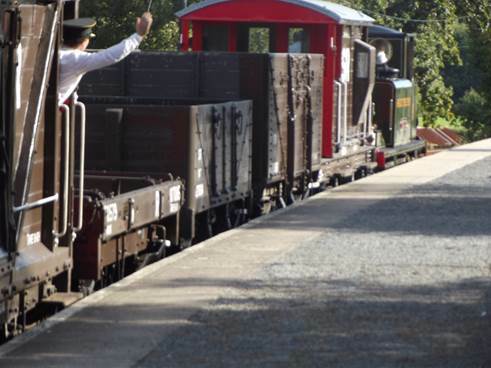 But then Ruck was saved by the good Controller who re-opened a length of railway so that the children could come and see what the railway used to be like. Ruck wasn’t very important and for years he still sat in a siding awaiting his turn. Eventually the railway had the engines and carriages it needed. Ruck and some of his friends were restored to working order. 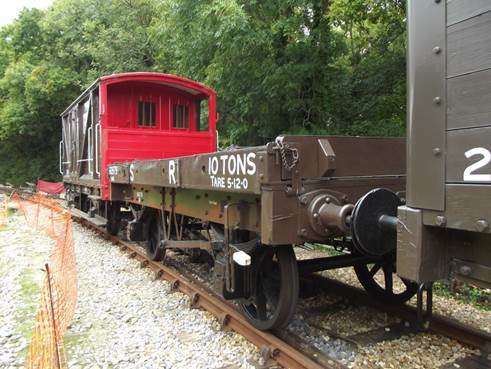 They had no real work to do but, on special days, they could remind people of what a goods train once looked like. 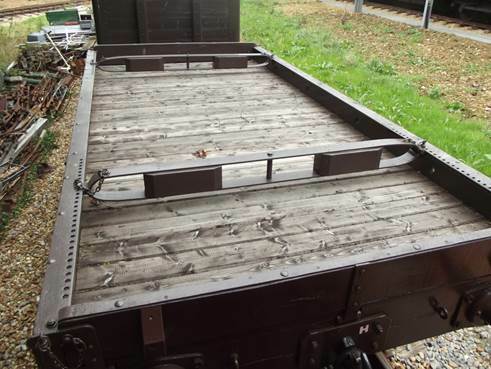 One day Ruck was a part of a goods train. There were lots of visitors to see Ruck and he felt very happy. Ruck and the trucks were to be pulled by a very old engine called Freshwater. Freshwater was a small engine and the trucks decided they could have some fun with him. They kept very quiet as Freshwater was coupled up. Soon the train set off on a journey from Havenstreet to Wootton. Ruck saw the photographer and felt really proud. ‘He’s come to see me’, he chortled, as Freshwater hauled the trucks away. Freshwater was happy, too, as he tugged the trucks away. Freshwater had always got on well with trucks and he was sure he could keep Ruck and the others under control. 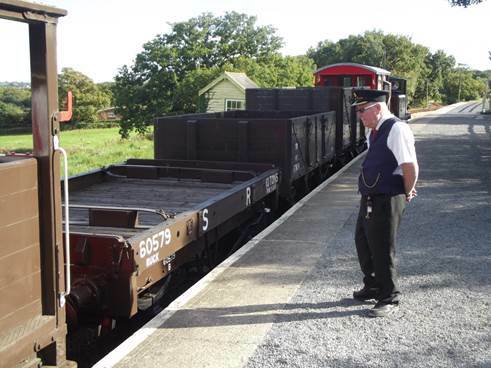 ‘Poop poop’, he said as he left the station and passed the yard. ‘’We’ll have you yet’, the trucks rattled in reply. Freshwater worked hard and soon he arrived at the end of the line at Wootton. It was quiet there and the trucks decided, with nobody about, they’d push hard. Little Freshwater tried to stop the trucks but Ruck and the others kept pushing. But the trucks wouldn’t stop. They kept pushing Freshwater on. Freshwater got worried, but nothing he could do made any difference. ‘We’re going to push’, the trucks chortled in reply. By now the Controller knew something was wrong and came out to try to help. But the trucks – Ruck and the others – kept pushing. With a final effort, Freshwater just managed to stop with his front end nestling against some bushes. ‘Ooh! Er! Ouch!’ said Freshwater. Oh how Ruck and the trucks all laughed! The driver and fireman were all ready to jump as Freshwater screeched to a stop. The Controller was not a happy man. He quickly established that Ruck was the ring leader. He stood over Ruck and told him he was a very troublesome truck. ‘Im s s sorry’, sobbed Ruck. ‘I felt so proud because the photographer took a photo of me. I felt I was more important than the engine or the whole railway’. ‘Well, they say pride comes before a fall’, said the Controller.’ It’s back to the sidings for you and the rest of the trucks and there you’ll stay until you have learned your lesson’. ‘Yes sir. Sorry sir’, said all the trucks, feeling very downcast. By now Freshwater had sorted himself out and was ready to haul the trucks off to the siding. The guard waved the ‘right away’ and Freshwater and the trucks moved off. I don’t think the trucks will be in disgrace for long. They learn their lessons quickly and will be wiser and more careful in the future. But for now it is time to say goodbye to Ruck and the other trucks. October 28th 2013 was billed as ‘Great Storm Day’ or St Jude’s Storm in my part of the world. 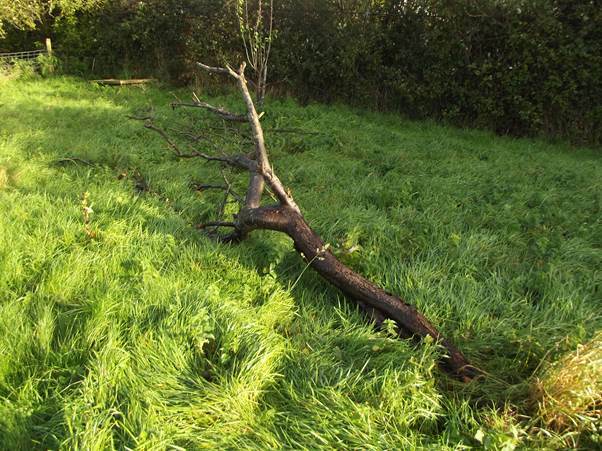 We were warned to expect trees down and damage – and there has certainly been damage across the south of England. 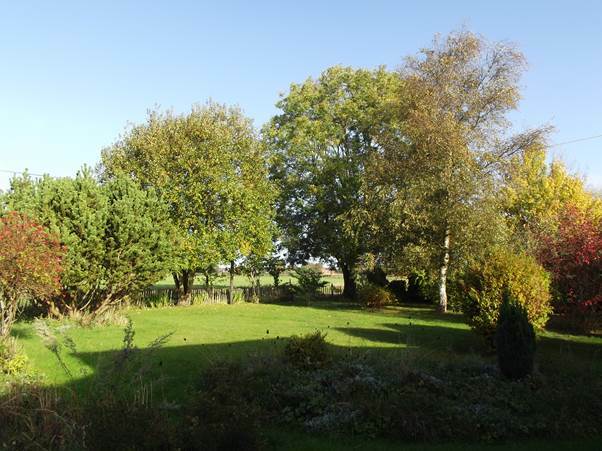 Whilst setting out for a walk on October 27th, I took a photo of the trees in my front garden, just in case they were horizontal by the next morning. 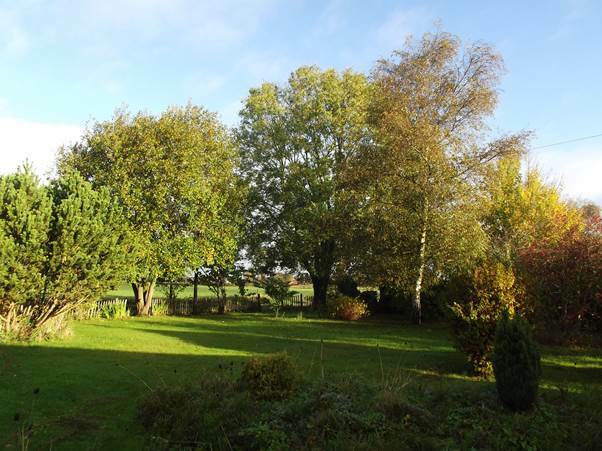 Now let’s look at the scene after the storm on 28th October. There really isn’t a lot of difference to be seen so I’ll quote from Lewis Carroll’s Jabberwocky. That’s how it is for me, to see my trees still standing. But, I do have a tree which has been downed by the storm. I can report that the storm has been useful to me, I had a dead plum tree, destined to become firewood this winter and I have been saved the trouble of felling it. Other than that, all looks well. So now, life is back to as normal as ever here. The class of railway locomotives known correctly as class A1 or A1x very rapidly became my favourite locos when I was a train spotter. Back in 1960, engines of this class, known as Terriers, were the oldest engines still at work on the British Railways network. They had been built, from 1872 onwards, as engines to pull London suburban trains. They were small engines, amazingly powerful for their size, and they proved very successful. That meant they soon did themselves out of a job. More passengers meant heavier trains and bigger and more powerful engines were needed to pull them. Some of the Terriers found alternative work on the old London Brighton and South Coast Railway system. Notably, there was a swing bridge at Newhaven which wasn’t strong enough for heavier engines and a wooden viaduct on the Hayling Island line needed light weight engines too. A few Terriers survived, with their original company, to run these lines. 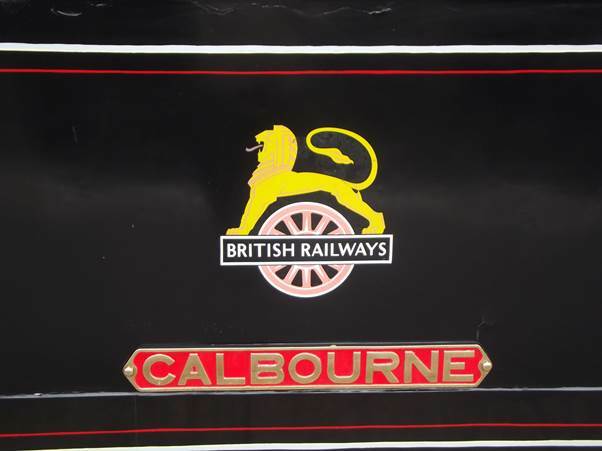 One or two more were retained as works shunters but a fleet of others were sold off to big and small railway companies. Some went to the Isle of Wight, but Brighton built Terriers could be found on obscure branch lines up and down the country. Some of these engines which went to other companies eventually found their way back again. We can fast forward to the railway grouping of 1923. 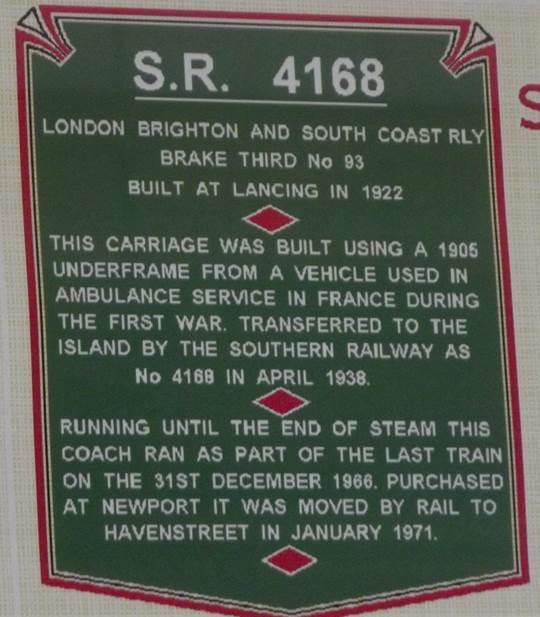 The old Brighton company joined with others including the lines on the Isle of Wight to become the Southern Railway. A lot of Terriers now belonged to that company. By the time I was a train spotter the railways were nationalised. Terriers had left the island and all worked on the mainland. There were thirteen of the engines in 1959. Some still lived at Brighton. Others were at Lancing, Fratton and Ashford. My favourite was number 32635. This had been painted in the original 1870s livery which I thought was glorious. It used to move carriages and trucks around Brighton. And now to the Isle of Wight earlier this month. 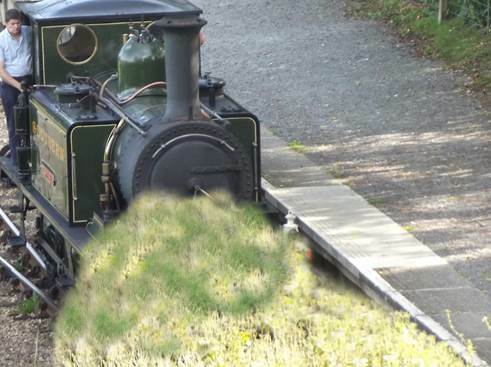 At that steam gala one Terrier was at work. 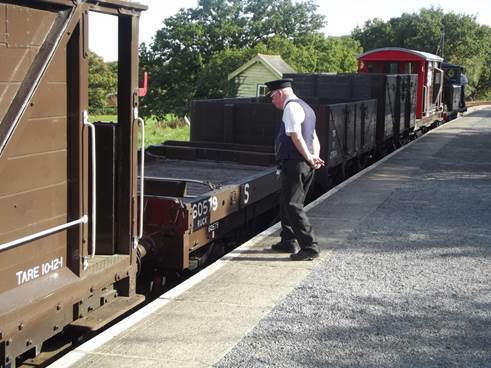 There was a first sighting of Isle of Wight number 8 with a person just about to couple up to a goods train. Do you know, no matter what colour, I still reckon they are very handsome engines. This one carries the name Freshwater. Later, Freshwater was put in charge of a passenger train. The carriages here are interesting. The Isle of Wight Steam Railway identified 80 or so carriage bodies in use as beach huts, chicken houses etc. on the island. They have acquired some, mounted them on much newer parcel van frames to produce a set of coaches which are really very historic. There is one coach body which dates from 1864 which makes it even older than the Terrier. There’s a view from the cab. A brief history of the loco. She was built (at Brighton, of course) in 1876 and was sold to the London and South Western Railway in 1903 to operate the Lyme Regis branch. 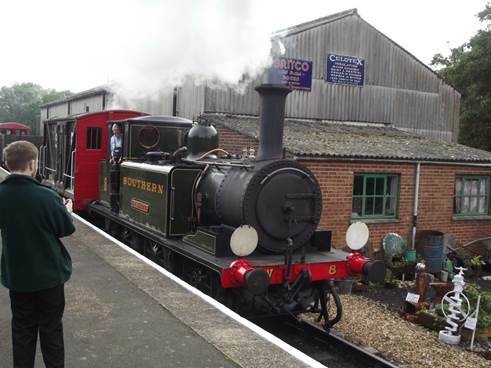 The Freshwater, Yarmouth and Newport railway hired the loco in 1913, bringing it to the Isle of Wight. In 1923 it passed to the Southern who gave it the number 8 and called it Freshwater. 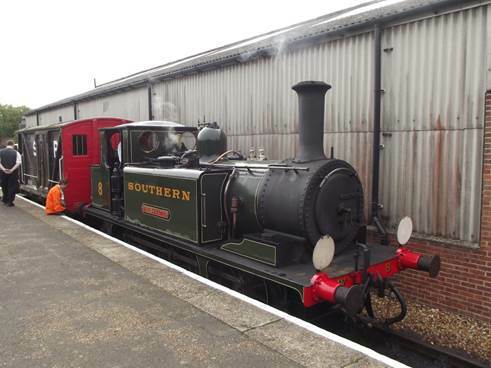 She stayed on the island until 1949 when she returned to the mainland to help on the Hayling Island branch. 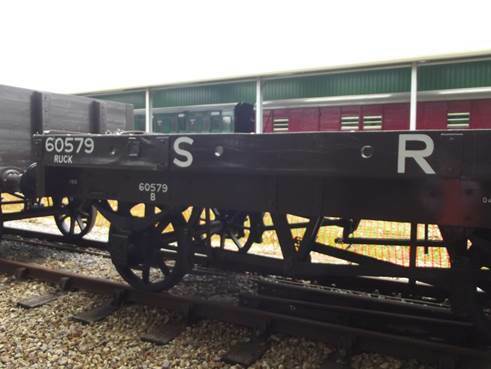 She was withdrawn from service in 1963 and after a three year ownership by a railcar company, the loco became an inn sign on Hayling Island before being purchased by the Isle of Wight Steam Railway in 1979. She was fit for service by 1981. Engines can only remain in service for ten years. Boilers operate at high pressure and could be lethal if they got weak so every ten years major works are required. Freshwater actually had a brand new boiler in 1998. 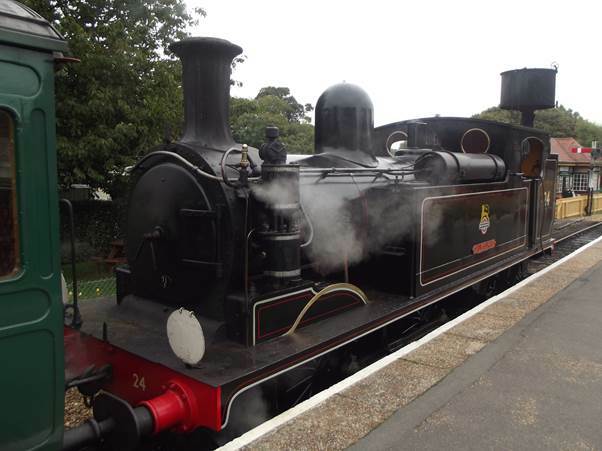 And she is still steaming in 2013 at the age of 137! 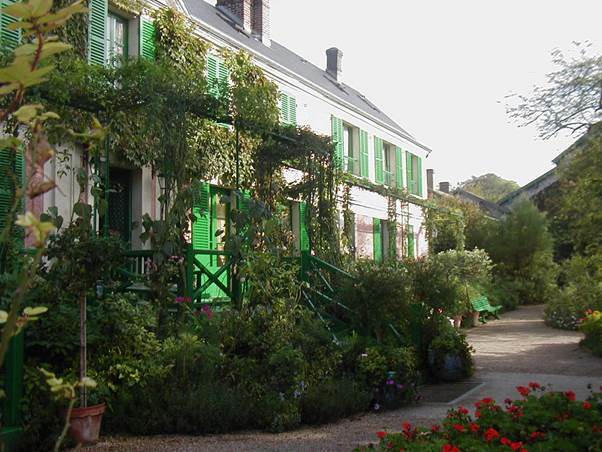 Giverney was a long time home of artist Claude Monet. He was the chap who was credited with founding the impressionist style of painting. 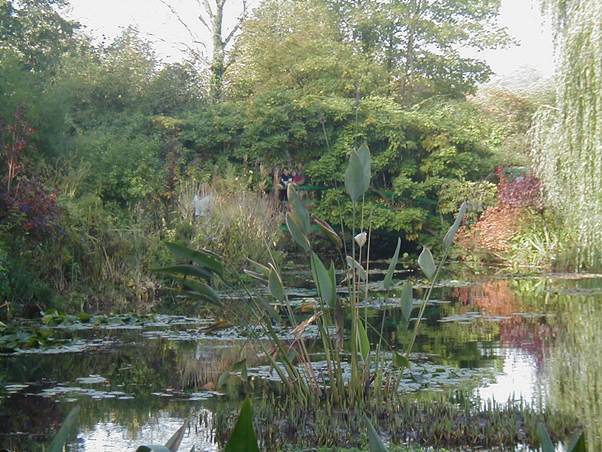 Much of his work was done at Giverney which is a lovely place to visit. Here are some of my photos from 30th October 2001. 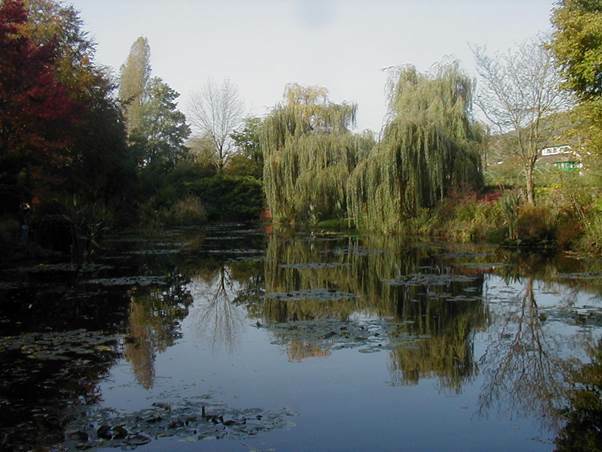 Being October, the famed water lilies were no longer flowering. No flowers, but the lily pond was still lovely. Being a nerd, I really shouldn’t do art. 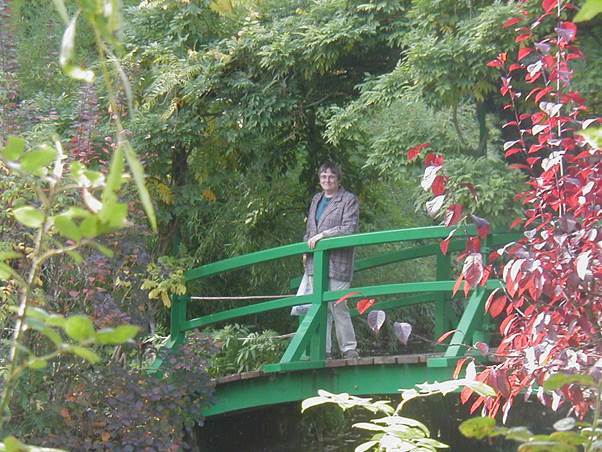 But Monet seems to suit me. Indeed, I have a Monet print above my computer. It’s one of his series – Poplars on the Epte. The Epte is the river by Giverney. I look at it frequently and it seems to help when I am writing. This blog celebrates its first anniversary today. If I ever met Great Uncle Sam I don’t recall it. That’s a shame for it seems I was almost ten when he died. Had he lived a little longer we’d have had a family car and might have got to see him. So my knowledge of Sam is based on what my dad wrote – and here is his paragraph about Sam. UNCLE SAM. Sam was dad’s brother nearest to him in age and was the most obviously bright of the brothers, not necessarily more intelligent but more of what would now be called a lateral thinker. He had risen to the rank of warrant officer during the war when the others had all remained as privates or gunners. We did not see him often but in some sense he was my favourite Uncle. He was Recorder for East Sussex Milk-Recording Society travelling around to check the reliability of records maintained on member farms. (He checked my weighings once during the war when I was looking after a herd.) In my childhood he lived at Hadlow Down which had the disadvantage of being difficult to reach from Bexhill by public transport. His wife, Nell (Unsted) was a bit sharp spoken and I never felt wholly at ease with her. When I last saw her in 1941 or 42 she was a distressing site being warped by arthritis; she died soon after. Sam kept the home going but he died of a coronary around 1958. I can comment on the inconvenience of travel in times past. It was but 15 miles in a straight line between Sam’s house and the Bexhill home of my grandparents and dad. But the journey was nigh on more than could be achieved in a day. They’d have needed a bus to get to the central station in Bexhill, followed by a train to Lewes and another on from there to Buxted. Then they’d have needed a bus to Hadlow Down and still something of a walk to Sam’s house. That public transport journey worked out at about 38 miles, hardly a major distance, but it involved four different buses or trains and waiting times. It would have taken hours. So Sam and his family remained a bit of a hazy set of people. But of course, I have photos although Sam seemed not to be in the Edwardian family postcard writing set. 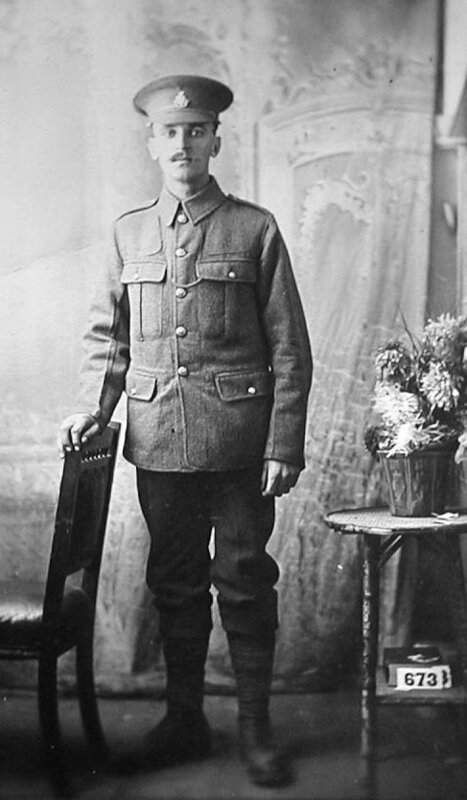 This must be Sam, the new recruit, ready to go off to fight in World War 1. By then he was already married to Nell and they had two sons. Sam was promoted in the army. 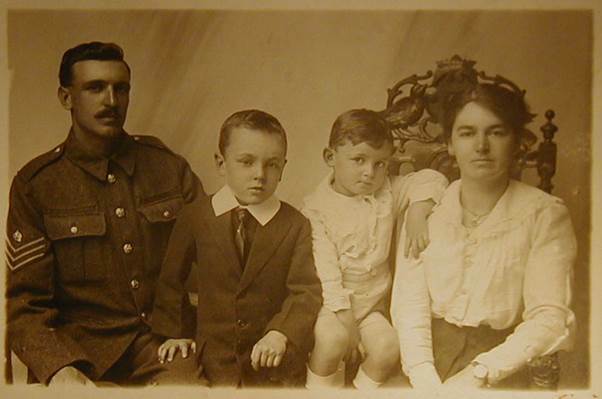 This family photo shows Sam the sergeant and Nell with sons Aubrey and Don. I have no photos from Sam’s later life. I should never have chosen to write this. I’m not the world’s best speller (although I’m by no means the worst) but some words cause me to panic when I have to spell them. Aerial is one of them. Perhaps writing this will help to get the spelling into my head. 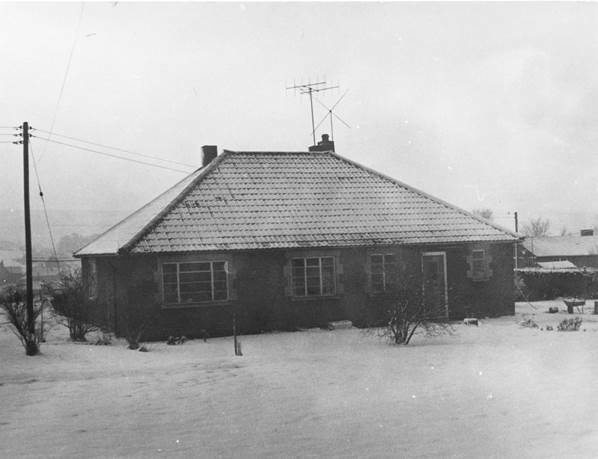 We bought our present house in 1976. Although it was only built in the 1950s it was very run down. I’m not sure when this photo was taken, but I took it. Obviously it was winter for there is snow about, It couldn’t have been winter 75/76 before we moved in because I note the front door we fitted to replace the rotten thing that didn’t stop weather and wouldn’t have stopped any burglars. But the things that sticks out, to me are the TV aerials. 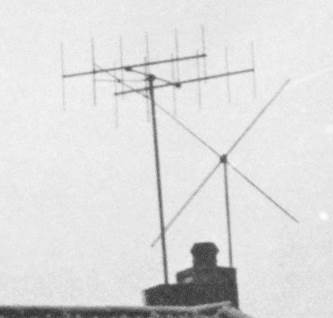 It’s now quite hard to remember that once upon a time virtually every house sported aerials like these. Actually, that time was before 1976 when we moved in. The aerials I see in the picture were for the old 405 lines transmissions in black and white only. By 1976 most people had moved on to the 625 lines system and colour. These old aerials were redundant even then. At some point we had them removed. Bits may well still survive as supports for plants or fences. Other than that we have no external aerial. We are not great telly watchers and we find a little internal aerial and small screen are good enough. 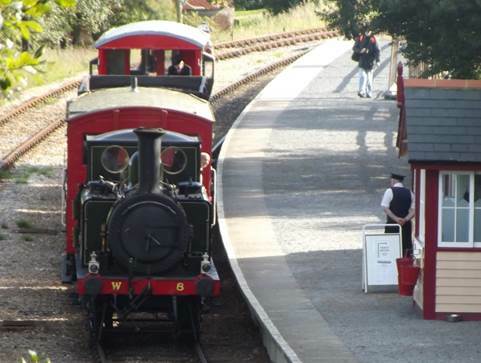 Like many a preserved railway line, the Isle of Wight Steam Railway is quite short at about 5 miles. I could be cynical and say that the financial powers that be at these railways don’t like a long train journey for passengers sitting on a train and enjoying the experience are not spending more money. But I don’t think this railway thinks like that at all. I suspect they’d love to have access to more line but at least we can be thankful that they have the five miles of delightful, scenic railway. 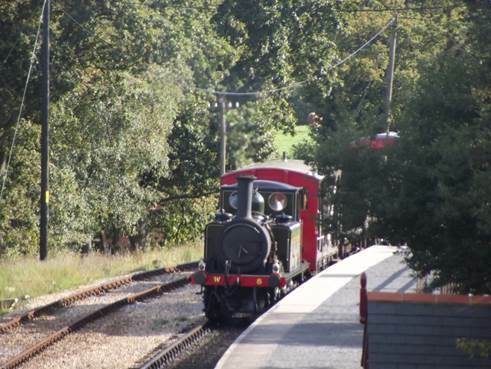 For much of the operating year, the service can be operated with just one engine in steam but in the peak season, two are needed to run the service. 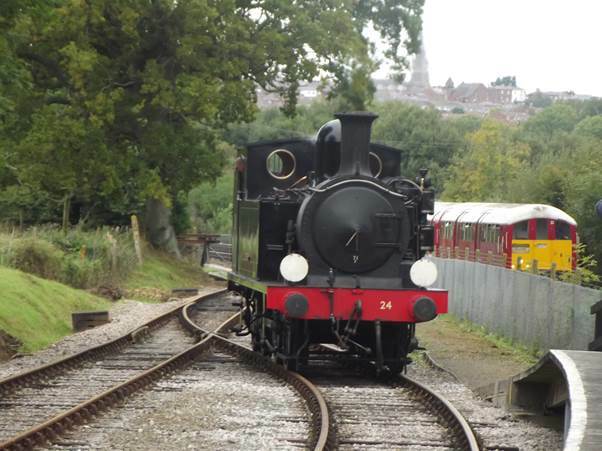 What made the September 2013 steam gala really special was that four engines were in steam, sharing out the duties of operating two passenger sets and a demonstration freight train. It reminded me of the island’s railways back in the early 1960s when elderly steam engines with near antique coaches were trundling down the main line from Ryde every few minutes, each one crowded with trippers off the ferry from Portsmouth. One of the things that made me determined to be at this steam gala was that one of the engines in use was to be the only survivor of the class of engines which used to run that intensive service 50 or more years ago. Not only that, it had a train of carriages that were also used back in those long ago days. So we’ll start with that engine and train. There’s a part of one carriage. It is all separate compartments. There is no corridor. Do you know, I feel old when I think I frequently used to travel on trains like that. By the way, the carriage is in just the shade of green I think all carriages should have. Two things are different from ‘the old days’. By the time I was a train user, 3rd class had been abolished. The carriages didn’t change but they were called 2nd class. The other difference is that volunteer enthusiasts make the trains clean. They would, no doubt, have been much grubbier back in the 60s. 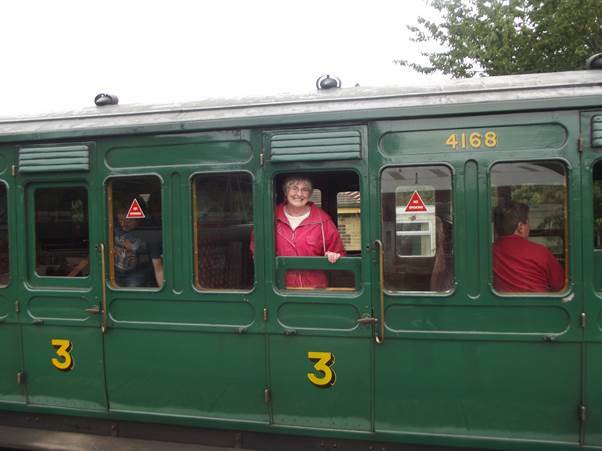 This carriage had a board inside that it wouldn’t have had 50 years ago, given a brief history of the coach. There’s the engine, attached to the train. She, like all the locos on the island, is named after an island place. 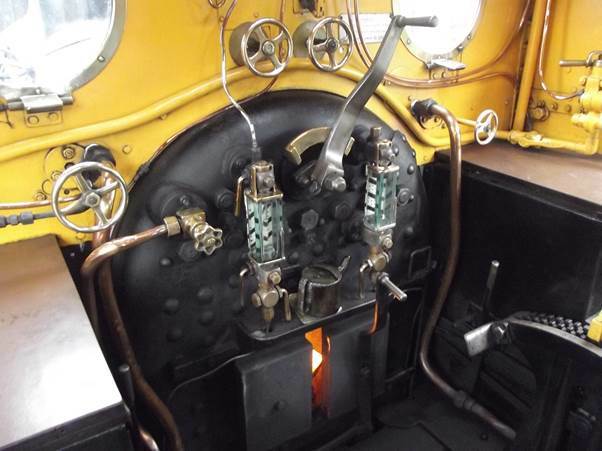 The Isle of Wight Steam Railway seemed happy to let us old nerds ‘cab’ the engine. These old engines, which date from the nineteenth century, are very simple machines. 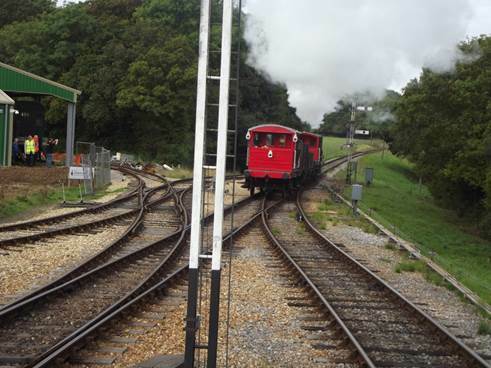 At Smallbrook, the line meets up with the main line from Ryde down to Shanklin. Our steamer has to run round the train for the return journey. Handily, it did it just as an ‘Island Line’ train was arriving at its platform. The Island Line is electrified but it still uses historic stock. That’s a 1938ex London Underground train. 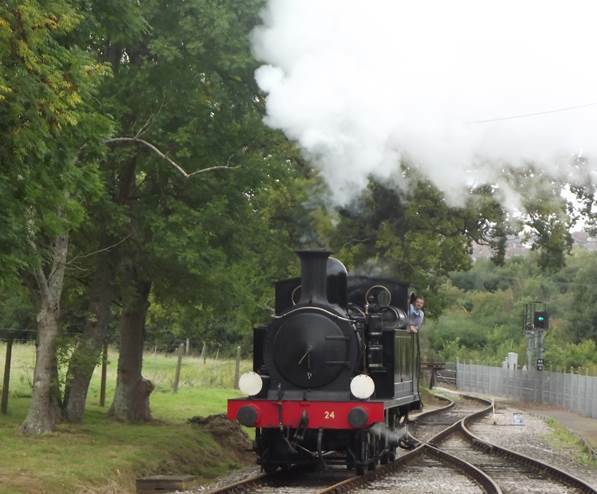 As Calbourne runs around we can enjoy the sight and sound of the engine. Fantastic! We’ll return to this Gala again some time. I love the Isle of Wight. I love the way it really does seem to be a journey back in time when you cross The Solent. 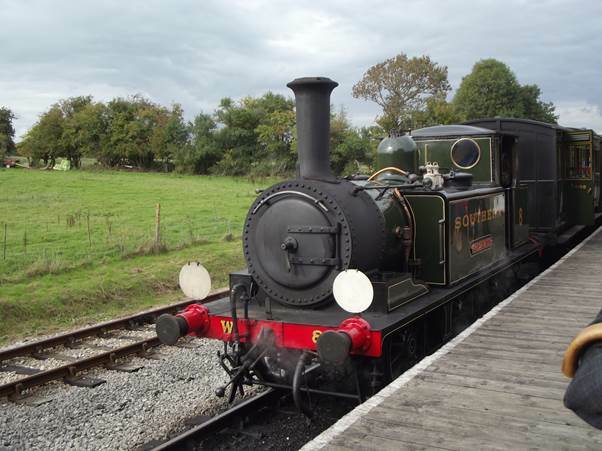 And of course, I love the Isle of Wight Steam Railway with only a regret that not more of the network survived. The Isle of Wight Steam railway is manned (that’s man embracing woman of course) by as cheerful and helpful a bunch of staff and volunteers as you could wish for. Our recent personal experience is that they’ll do anything for you there that they possibly can. But I feel just a tad let down in the matter of the ticket. 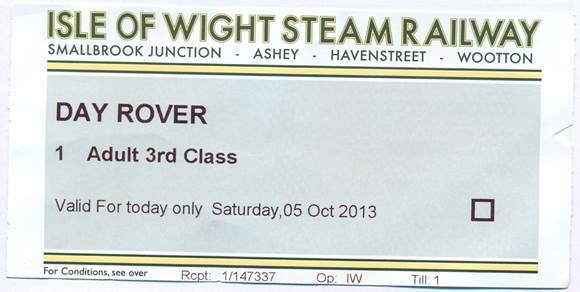 On my ticket I am described as Adult – 3rd Class. Now that amuses me and of course it represents the situation 60 or so years ago when railways had a third class. This is my recent ticket. No, I don’t feel too let down by being an Adult 3rd Class but I really would have liked a ticket appropriate to 60 years ago – the old standard style of ticket known as an Edmonson – the same as several of the tickets which have appeared on this blog. Of course, tickets like this one no doubt come from machines which do all the accounting as well so I can see the advantage. But somehow this ticket doesn’t have the appeal or convenience of the Edmonson variety. But of course, this is an incredibly minor niggle and I can tell you that Saturday 5th October 2013 was a steam gala day. 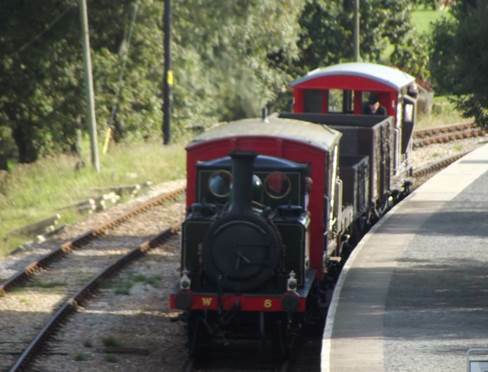 There were four locos in steam and a simply superb day was organised. 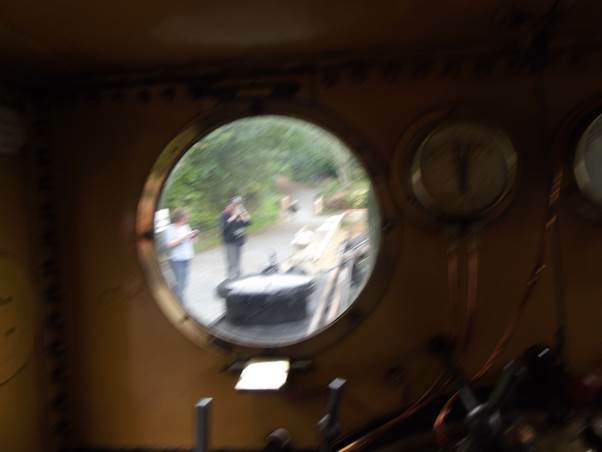 We managed to get hauled by three of the locos and, no doubt, I’ll describe more of the day at some time in the future. Meanwhile, real thanks to all those staff and volunteers who gave us such a memorable day. These days refuse collection is a high tech affair. Huge lorries pick up the wheelie bins and may weigh them, recognise who the bin belongs to and even keep records of it all. To cram as much in as possible a press compacts the rubbish into a tight, tiny space. Back in the 50s a much more personal service was not a bit like that. A small lorry with opening side hatches can round. The dustmen (or refuse collectors) came around to your back garden, collected your bin, took it out to the lorry and emptied the contents via the side hatches and then returned your bin. Of course, at Christmas time they may have made some extra clattering noises to remind you they felt entitled to a Christmas box – a small some of cash for their kindness and hard work throughout the year. 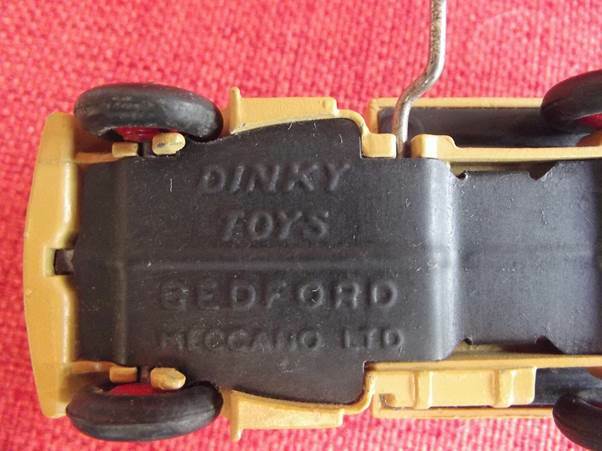 I do not have a photo of such a lorry, but I do have a Dinky toy version. What a little beauty! 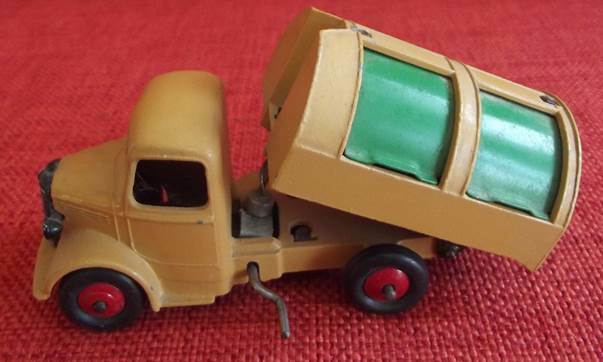 I certainly had one of these lorries as a kid. It was old (as ever it was not new to me) and battered. This one – and I’m not sure if it is the same one, has been renovated by my brother-in-law who at one time enhanced his income by meticulously doing up such toys. I have opened one of the side hatches for the photograph. 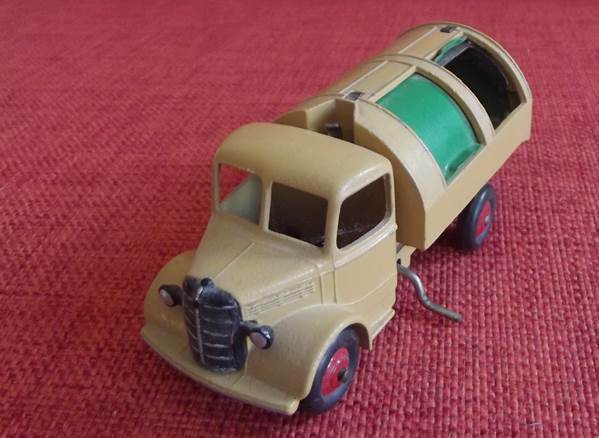 This is a Dinky version of a Bedford truck. The first version of this model came out in 1948 but they were popular and stayed in production until 1965. If this is the very one I had as a child then it will be an early one. So what’s that big handle on the side for? Well, like the real thing this is a tipper lorry. It has a rear hatch and if you wind the handle you tip the refuse container and the contents can fall out of the rear hatch. It’s a lovely model and thanks to Bill for doing it up.